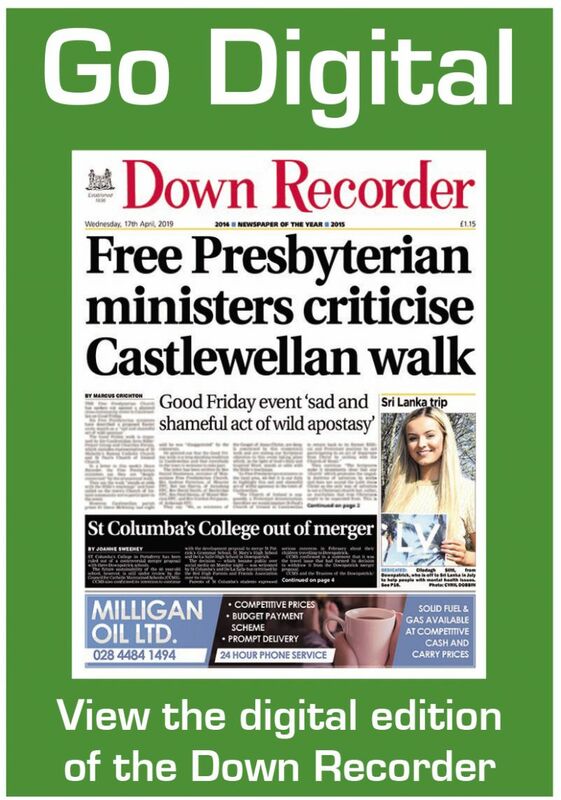 THE Free Presbyterian Church has spoken out against a planned cross-community event in Castlewellan on Good Friday. ST Columba’s College in Portaferry has been ruled out of a controversial merger proposal with three Downpatrick schools. DROMARA adventurer Noel Hanna sprang into action to help when a plane crashed just 30 metres away from him in Nepal. A PLANNERS’ recommendation to refuse permission for an unmanned petrol station adjacent to the Ballymote shopping centre on the outskirts of Downpatrick has been overturned. THE daughter of the 48 year-old Castlewellan woman who died in a car crash at the weekend has described her mother as a “big-hearted woman who inspired others”. A BIG-HEARTED former millionaire has praised local people’s generosity as being “in a different league” to the rest of UK as he walked along the Co Down shoreline last week on an epic charity trek. TRIBUTES have been paid to Castlewellan man Teddy Hawkins, who has been described as “a true Mourne and NI mountaineering legend”. THE members of Strangford Sailing Club celebrated the opening of a new £160,000 clubhouse at the weekend. A GROUP of motorsport enthusiasts have unveiled plans to erect a memorial in Killyleagh in memory of road racer Brian Steenson who lost his life at the Isle of Man TT in 1970. BALLYNAHINCH was at the centre of Ireland’s sporting world at the weekend. THE champagne corks popped loudly in the cold night air at Mountain Quarter, Saul, last Thursday night when Celtic Bhoys secured the point needed to lift the Newcastle League Premier Division title for the first time. BALLYNAHINCH completed an historic treble in Dublin on Saturday and in the process retained the Irish Hockey Challenge Cup for the second year running. NEWCASTLE AC juniors attended the first meet of the Firmus Fab 5 Series at the Mary Peters Track on Thursday night, taking part in nine events collectively. ST Patrick’s lifted the Breen Cup following a scintillating display against Crossgar in the final. THEY say you shouldn’t mix business with pleasure, but that’s not the case for Scarlett Burnside who finds that her passion for showing dogs mixes perfectly with her studies at South Eastern Regional College’s Downpatrick campus. ORGANISERS are busily preparing for next month’s annual Three Lakes Challenge event outside Downpatrick which will be raising money for Mainstay DRP. COMBER actor Rosie Barry is to star in a new drama which aims to portray people with special needs as endearing and flawed as those who are deemed to be normal. TWO Northern Ireland Water staff members from Castlewellan will be part of the organisation’s relay teams taking part in next month’s Belfast Marathon. A DOWNPATRICK woman used her 50th wedding anniversary to give back to Action Cancer after it helped her cope with her cancer diagnosis.